It is currently Thu Apr 25, 2019 4:10 pm. Hail! I just got a new computer and it has windows 10 on it. I have not used anything other than XP pretty much ever. Is there any super-important things I should know about getting uo installing before I get started? Thanks. I did the free upgrade from W7 and everything seemed to run fine....except UO. Tried various options for compatibility mode and such and just couldn't get it to work right. The cursor was really choppy on the game screen and it was laggy. No idea why it did that, but I reverted back to W7. That's right...I reverted back to W7 JUST so I could play UO. No issues running UO through razor on my Windows 10. Patek's help on setting up compatibility mode made reagent tracking work like a charm again. I installed 10 on 2 machines a few days ago. Other than my printer on a tablet/laptop I have had 0 issues including UO. I didn't adjust anything. UO works perfectly. Thanks for the help people. It's running good, but now I have no counters in the title bar, and I do have the appropriate boxes checked. Make sure the razor home screen is directed to the proper UO directory. Both the client selector and the directory selector must be correct for counters to work. Windows 10 behaves like malware. I recently had the exact same issue, in a Win7 environment: the only stable fix I found was to install Razor version 1.0.14.9, which I grabbed from here; I have had no problems, since. I right clicked razor and UO and hit run as admin and it didn't work, is it more complicated than that? I am not sure what differences exist between Win10 & Win7 but, in Win7, I would confirm that the .exe's, in their home folders, have their default set to "run as adminisrator"; right-click on the file(s) to view "properties". 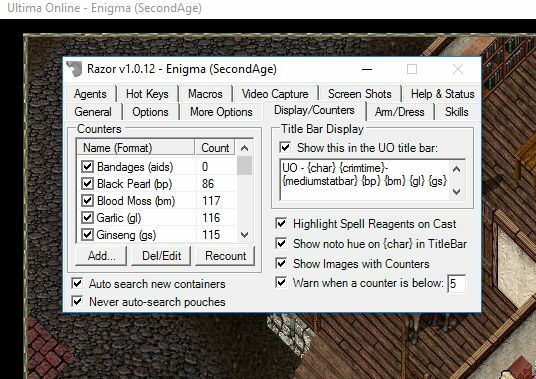 Did you try Razor v. 1.0.14 (the SS of your counter-problem shows v. 1.0.12), as I had suggested, and did that not work? I hope you get things sorted-out: my own counters-issue, while trivial, nevertheless annoyed me. are you sure the razor compatibility mode is correct. OK, got it now, thanks for all the help people.